From sleep trackers to brain-monitoring VR headsets, the wearable world has been expanding into some interesting new areas at CES 2018. But this new bike helmet from Coros might be the most interesting wearable gadget we've seen, if only for how elegantly it answers some big road safety questions. 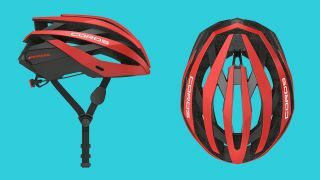 The Coros Omni appears at first glance just like any other cycling helmet, and at its core it serves the same main function – take a nasty tumble, and it'll protect your noggin from as many bumps, bashes and bruises as possible. But look a little more closely and there's some smart design considerations squeezed in. Perhaps the best inclusion is that of bone-conducting audio. When out for a long cycle, it can be great to have some tunes playing, but also dangerous to close your ears off from the sounds of the road. With bone-conducting audio points integrated into the straps, your ears remain free to listen to the traffic around you, while still hearing tunes rattle around your head. If you're cycling at night or in low visibility, the helmet also features two strips of light on the rear to help other road users more easily spot you. Combined with the audio playback, connecting to your phone over Bluetooth, you'll get 8 hours usage from a single charge. And if you can cycle for more than 8 hours in a single journey, you're probably superhuman enough to not need a helmet anyway. Should the worst happen and you be involved in a collision, a built-in crash sensor will alert designated friends and family of what's happened, sending an alert through your phone. Just make sure you don't drop it and accidentally trigger a false alarm. Paired with a handlebar remote for controlling media playback, the Coros Omni bike helmet is slated to launch "this quarter" with a $199.99 (around £150 / AU$255) price tag. Shipping in black, red, blue or white, it'll also come with detachable visor and travel bag. If you're super keen, an Indiegogo pre-order campaign, at its cheapest tier, drops that price to a sweet $129.99 (£95 / AU$165), too. So get pedaling over there if you're after a bargain.